It's almost that time again. Yep, the mad month of November when all those crazy and optimistic writers attempt the not-so-impossilbe task of writing a novel in 30 days. 1. Word Count Widgets- I know it seems silly and a tad trivial, but I sure love to enter my word count and see those stats rise. I haven't found any other word count meter that I love as much as the NaNo meter. 2. Community- We all know how solitary the act of writing is, and even though I'll still be alone pounding out my words, it's nice to know that so many others will be at it with me. 3. Be a Winner- Who doesn't love winning? It might not be a million dollars, but I love being able to say I've won something. And that cute little web badge is almost as awesome as the finished manuscript I'll end up with. 4. A book- Oh yeah, that's a pretty great reason to do it too. After thirty days of torment, I'll have about two hundred pages to show for it. So what's the verdict? 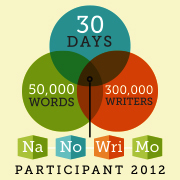 Are you going to attempt NaNoWriMo this year? If so, let's make sure that we're writing buddies. I can't Nano--it's just not how I work--but I LOVE catching the deets on all those who do! Have fun! Afraid I'm a bit of a NaNo naysayer, since November's always so busy, but I'm so proud of everyone who does it. Good luck next month! Can I come sit in your front room and finish my play in November?